In the long awaited sequel to Fire in the Belly father and son authors Sam Keen and Gifford Keen write the next chapter of one of the defining books of the men's movement. Filled with personal stories of their own struggles and breakthroughs Prodigal Father, Wayward Son is a warm and engaging book on masculinity, and a compelling and dynamic invitation for readers to recall the memories that define their own father-and-son relationships. A central theme of the men's movement was the alienation between sons and fathers, but after having explored this theme, the movement stalled. 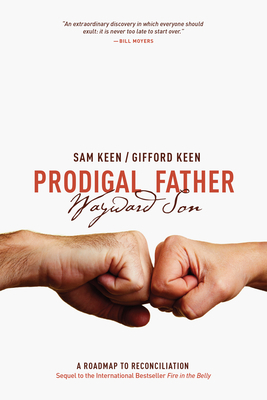 Similar to the memoirs of Pat Conroy and Andre Dubus III about their fathers, Prodigal Father, Wayward Son points to the next chapter in that story - the reconciliation of fathers and sons. Sam and Gifford Keen provide guidance and inspiration to those looking for positive role models and teach new ways to move beyond old wounds. They offer proven and concrete methods to overcome long standing enmities and misunderstanding and become reconciled through a process of telling our long-held, but often unexamined, myths and stories. With Prodigal Father, Wayward Son Sam Keen delivers the crowing achievement of his remarkable literary career and a moving account of repentance, forgiveness and reconciliation that sets it apart from any other books in this genre. Sam Keen was educated at Harvard and Princeton and was a professor of philosophy and religion. He was a contributing editor of Psychology Today for 20 years and is the author of the bestselling "Fire in the Belly" and a dozen other books. He co-produced an award-winning PBS documentary, "Faces of the Enemy." When not writing or traveling around the world, he lectures and leads seminars on a wide range of topics. He lives on his farm in the hills above Sonoma, CA. Gifford Keen has a liberal arts degree from St. John s College in Santa Fe and has worked in a variety of professions from apple picker to software executive, from carpenter to real estate investor. He describes himself as a retired software geek, reluctant landlord, and aspiring novelist. Gifford is the father of a teenage son and has a daughter in college. He lives with his wife in Santa Fe, NM, where he writes, meditates, practices yoga, and takes long walks in the high country.